We offer a wide array of water infrastructure solutions designed to fit exactly what you need. We are happy to customize solutions. 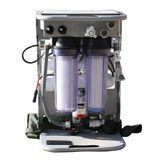 Racor Ultra Filter (RUF) units provide portable fresh water filtration. The self-contained water supply is treated using 20 micron sediment filtration, carbon filtration, ultrafiltration membranes, and ultraviolet radiation. Portable, and able to produce either 25 or 30 Gallons Per Hour, this is an ideal solution for disaster relief applications. There are three models available, including the RUF-25, RUF-25 with Solar, and RUF-30. The RUF-25 and RUF-30 is powered by a 12-volt vehicle auxiliary power source (cigarette lighter), and the RUF-25 Solar model is powered by a lightweight folding solar power pack. VMT PDRS (an EUWP) System can provide water when and where it is needed. The PDRS consists of two separate ISO configured platforms that are compatible with commercial transportation and material handling equipment. A team of four trained operators can have the PDRS set up within 6 hours and it can operate unattended for extended periods. A network connection will allow the system to be monitored and/or operated remotely. The PDRS uses ultrafiltration (UF) to produce over 250,000 gallons per day of potable water from a fresh water source and reverse osmosis (RO) to produce over 100,000 gallons per day from a seawater source. This system utilizes a double pass RO configuration to produce potable water when treating a contaminated source. EUWP Generation 2 advanced water purification system. The EUWP Generation 2 is a full-scale prototype of an advanced water purification unit. This prototype will be used for developmental testing to validate the design concept for use as a possible retrofit system for the CVN-68 Nimitz class nuclear aircraft carriers. 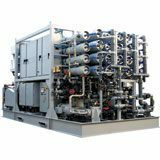 The Gen 2 unit incorporates enhanced technology to reduce energy consumption, size, weight, and maintenance burden compared with present naval desalination plants. The Gen 2 is capable of producing 322,000 GPD of first pass RO permeate that meets BUMED shipboard potable water quality requirements, 259,000 GPD of 2nd pass water with 5 ppm quality, and 256,000 GPD of 18-megaohm deionized water. The Gen 2 system consists of a Microfiltration (MF) skid and a Reverse Osmosis (RO) skid. The MF skid provides a constant flow of filtered water to the RO skid. The MF skid uses advanced design features to eliminate the need for filter replacement. The RO skid uses advanced technology to provide much higher water production rates than previous naval RO units. The system is also capable of operation at half capacity. young-moon.org is the official website of Young Moon, Inc., a California-based technology and venture capital firm. Tell us about your project needs! We are eager to learn how we could help you with our services. Feel free to contact us and let us know.